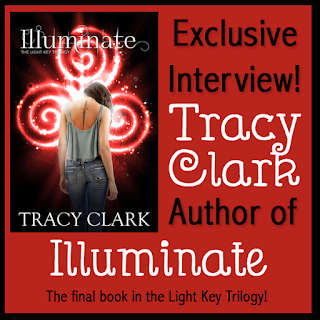 ILLUMINATE is the last book in the Light Key trilogy, and we're excited to have Tracy Clark here to tell us more about it. Tracy, what scene was really hard for you to write and why, and is that the one of which you are most proud? Or is there another scene you particularly love? There is a scene that takes place in St. Peter’s Square at the Vatican in which Cora does something incredible that she didn’t know she could do. It’s a beautiful act and the heart of this series—what of ourselves do we give to others and to the world? What do you hope readers will take away from ILLUMINATE? I hope readers will read carefully and perhaps see this book as a metaphor. I know that sounds cryptic and mysterious, but I love to use theme as an element in my stories. I think there’s a clear theme in ILLUMINATE and the series as a whole. Even if readers read for pure entertainment (I know I often do!) I hope they at least come away thinking about the energy we give and take from each other. 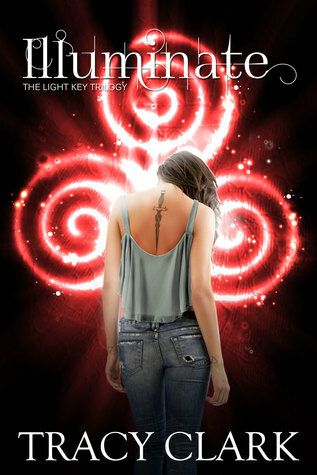 ILLUMINATE was the 7th book I completed. The first book I ever sold was SCINTILLATE but it was the 4th I wrote. I came very close—so close—to publishing my 3rd novel. That’s heartbreaking when it happens and I know it happens to a lot of writers. It blows my mind to ponder that I’m working on my 8th book now. Boils down to about a book a year (though I wrote two last year.) Now that I’ve done it, I’m amazed by authors who write and edit multiple books a year! 1) You’re a blend of ideas, experience, talent that no one else has. So if you’re compelled to write a book, take your craft seriously. Read, study, and above all…WRITE. Always strive to improve yourself so that “skill” is added to that list and you can write your story in the way it deserves. 2) Patience grasshopper--don’t expect to be published right out of the gate. If that happens, yippee! But often, it takes incredible resilience and patience. 3) As long as the process is joyful to you on some level (note: that doesn’t mean easy) don’t you give up. Not freaking ever. Never. Got it? Have you had a chance to read ILLUMINATE yet? Are you always striving to improve your skills? How are you with resilience and patience?